Your router is the most versatile tool in the shop. Bob and Rick will show you just some of the reasons why! Series 200 shows you how to add that finished look to both small and large projects. 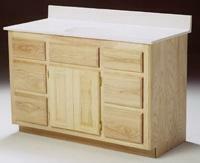 A large project, the Bathroom Vanity, features cabinet case work, panel doors and six drawers all made with your router. The Dovetail Liner Box features box joints corners, and dovetail liners for decoration. Bob uses tin can geometry to make shop fixtures for curved legs. Make dishes and decorative cut outs with guides, patterns and the router. Bob and Rick demonstrate just how easy it is to make a wooden-framed, full length mirror. 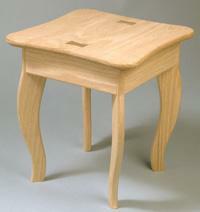 Produce perfectly matched taper cuts and mortise joints with the help of some shop-made fixtures and the router. Taper the mirror sides and mortise the rails into the sides. Pay attention to the wood grain to reduce tear out. 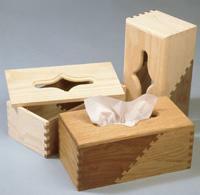 Replace that plastic tissue box cover with a genuine wood box that features showy box joints and perfectly routed tissue cut outs. It is easy to do, and fun too. 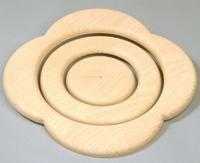 Just one piece of wood makes two circle frames, one with scalloped edges. Your router can cut perfect circles with finished edges. Rick and Bob show you how. Serve candies and nuts from playing card shaped wooden dishes that will be the talk of the bridge table. It's easy using your router with patterns. A great one evening project. Make yourself a coat rack with character. No plain Jane rack, this is made with a shop made repeating pattern fixture. Bob and Rick show you how to do it perfectly every time. Pattern dovetail joints are perfect every time with your router and a spacer fence. Bob and Rick show you how to make the complex liner joint and great corner joints. This cookie box will get more attention than the cookies. This vanity cabinet is a larger project that requires a five show treatment to cover all the construction information involved. The procedures have been split into five easy sections to simplify and clarify the process. A large project is just combining five smaller projects. 209. Bath Vanity, Part 1 Case Work The vanity case is made with dado joinery in this show (part 1 of 5). 210. Bath Vanity, Part 2 Facings This show (part 2 of 5) deals with the decorative facings using a mortise and tenon joint. 211. Bath Vanity, Part 3 Drawers There is a simple but effective way to make drawers with the table-mounted router. Bob and Rick show the step-by-step method in this show (part 3 of 5). 212. Bath Vanity, Part 4 Doors Bob and Rick demonstrate the easy way to build doors and calculate the material list. 213. Bath Vanity, Part 5 Vanity Assembly & Finishing Touches This episode, the last show in the series, deals with the assembly, including things to look for in hardware, using the router for hardware/drawer front installation and the finishing touches on the bath vanity.